A pretty sterling silver and crystal charm symbolising amethyst, the birthstone for February. Discover all the ways to express yourself with one of a kind jewellery that reflects your life and experience. Inspired by your personal sense of style, Chamilia jewellery is as unique as you are. 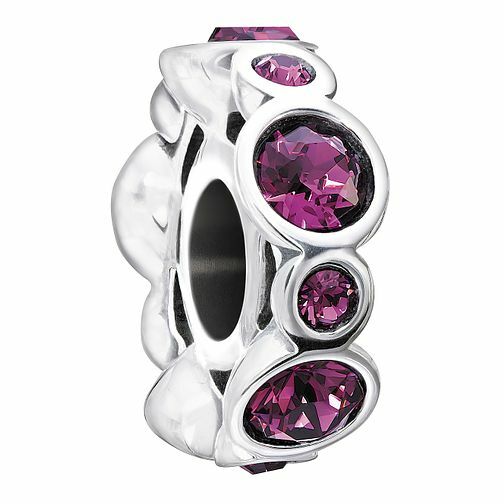 Chamilia Birthstone Jewels February Swarovski Crystal Charm is rated 4.7 out of 5 by 3. Rated 4 out of 5 by Anonymous from Chamilia Feb birthstone This bead/charm is lovely, beautiful colour and the only criticism I have is that it is very small, it looks lost next to the other charms and like it doesn't match this collection. My daughter won't change it as it's her birthstone but I personally wouldn't keep it.